In 1992, in the V Centenary of the discovery of America, the Mapuche people adopted a national flag that was presented for the first time to the Spanish king in his visit to Chile. The flag is based on the Nagche regional flag, but is quite different in the border, the stripes (only three) and the central emblem. This flag, with very minor differences, is listed under number 201 at the chart Flags of Aspirant Peoples [eba94] as: «Mapu [Araucania] (Mapuche Indians) - Chile.». In the spring of 1991 in Valdivia was celebrated a convention called Meli Witram Mapu of the Mapuche People. The adoption of a national flag was aborted and 500 projects were presented. Five projects were selectioned for the five regions of the Mapuches. The definitive national flag was approved in 1992. 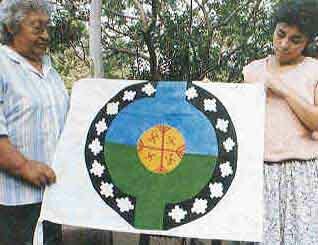 The Mapuche unified their traditional government in 1991 in the National Conference of Temuco (18-21 March). The Aukin Wallmapu Ngulam (Council of all the lands) dirige currently the Mapuche People. Some designs bear a central emblem named Cultrum, that represent the woman, the four directions (N, S. W and E), the perfect round of the Earth and the movement in the space. A photo containing a Mapuche flag from the argentine magazine El Arca del Nuevo Siglo, with a caption identifing two mapuche ladies (one from Argentina and a second from Chile) holding «a flag that ransoms back the identity symbols of the great Mapuche nation». At http://millamap.tripod.com/pprincipal.htm you can see an urban Mapuche community in Santiago: Asociación de Mapuches Urbanos Lelfünche. The native Tehuelche in Chile they have flag own comunicated by the Organización de Comunidades Mapuche-Tehuelche 11 de Octubre. I suspect that the name is for the previous day that the spanish arrived to America.